Each of us wants to find ourselves. We search occupations, relationships, foreign countries, and novels looking for the thing, the moment that makes us really embrace our being. We all want a confident answer to the only question that really matters: Who am I? Nikesha Breeze is a mage as much as she is an artist. She treats her process like prayer, adding intention, and a bit of self, to every element of her work: Her sculptural masks are created with a mold of her own skull; she has a 10-step layering technique she applies in her paintings because she feels it builds their consciousness. These are just some of the many ways she builds a mythology behind her works. "I need the resources of my art to be so much more vast than what I'm expressing in the art." Nikesha Breeze, 2018, Dignity, Resurrection/Reclamation Project, 6 ft x 5 ft, oil on canvas. Photo courtesy of the artist. The first African American to ever show work at the Harwood Museum in Taos, New Mexico, where she lives, Nikesha creates work about her reclamation of self. Around the time she dove into new mediums two years ago, she felt pulled to explore her identity. "There was a huge, huge movement in my soul toward really getting it, really understanding my inherited history, as well as how my being has been shaped by these intersections my whole life. I've had a very estranged relationship with my African American history, and my own self acceptance as a queer brown woman." Nikesha grew up with 10 brothers and sisters in Sherwood, Oregon. "I grew up in an all-white community, in a mixed and light-skinned family, so I have this very interesting relationship to my own blackness, mostly as a non-issue. Part of the explosion of my work was this massive wake-up call about my responsibility to my blackness, and my understanding and honoring what that has meant." An avid reader since childhood, Nikesha dove deeply into African-American history. She devoured troves of visual and oral histories, and as she absorbed them, she started seeing conjurings of people in her mind. So, she decided to paint them. "I went to Habitat for Humanity Restore and bought these doors. I said, 'I don’t even know how to paint, but I am going to try. I have to figure this out, I just keep seeing them.'" That was the beginning of her series Within This Skin. Recycled doors are Nikesha's canvases. She devotes days to building texture, applying thick layers of paint she lets dry and crack in the desert sun. "I am really process driven. Most of the painting is actually in the built-up surfaces below; there's about 10 stages of layering different powders, pigments and inks, water and glues. It builds the consciousness in the works. For me, with this specific project, it's really about the prayer." Each painting features one or many African Americans who appeared in Nikesha's visions. Nikesha Breeze, 2018, The Boys: Within this Skin, oil, pigment, ink, on closet door. Photo courtesy of the artist. She didn't have a studio when she started the series, and says doors were strewn about her one-room house as she completed seven paintings in about as many months. This was in the fall of 2016, and around the same time Nikesha was starting class at the University of New Mexico-Taos. Professors there like Sarah Stolar — a feminist oil painter and chair of the UNM-Taos art department — championed Nikesha's work, and helped her network. Others inspired her to go in new directions. Luther Atkins, a ceramics professor, pushed Nikesha to dedicate her time to a sculptural series she has named 108 Death Masks: a Communal prayer for Peace and Justice. On her website, she writes about the series: "Each face is meticulously sculpted to represent a single life in the countless stream of black and brown deaths in the United States and in the larger African Diaspora. From slavery and lynching to the current state of police brutality and mass incarceration, black and brown bodies have been the center of the largest war on a people that this planet has ever known. This series is an homage to the countless lives lost in the battle for freedom and dignity that continues to this day." Nikesha Breeze, 2018, 108 Death Masks: A communal prayer for peace and justice, individual ceramic death mask. Photo courtesy of the artist. 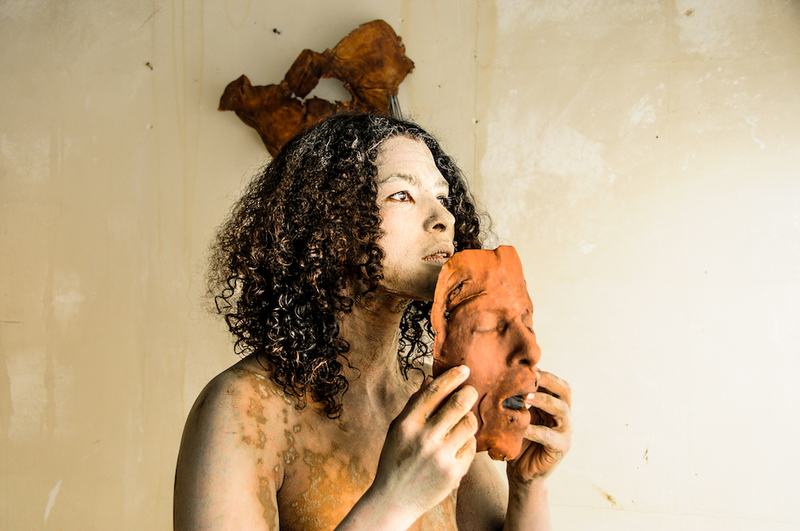 Nikesha presses a slab of New Mexico clay into a mold made from her own skull to create the base of each mask. She dips them in pure red iron oxide — which she sees as an interpretation of blood — and carves details for hours before she's through. "Everything that goes into these masks — time, prayer, consciousness, history, magic — in this way helps them become whole and layered, like we all are." When we speak, she's 35 pieces away from completing her 108-piece series: 108 is a sacred number, and considered essential in some Eastern schools of thought. The entire collection will be exhibited at ArtPrize 10 in Grand Rapids, Michigan, in September 2018. She plans to install it on a long wall in the Devos Place Convention Center so that visitors walk by them one by one, in a long line. She envisions visitors taking 108 breaths, or moments, to pray for human compassion. Nikesha cultivates the depth behind her creativity, spending her days in Taos soaking in the details of her history. She looks at photographs, watches films, listens to verbal histories on tape, and reads historical books. "Letting the stories seep in the night," she says, "and in the morning waking up and sculpting or painting. It's the saturation I've done the night before that is filling the iceberg. Everything I am expressing is just the tip of what I'm building underneath." Nikesha Breeze, 2018, Within this Skin with 108 Death Masks, Harwood Museum installation view. Photo courtesy of the artist.